It’s 2:00am on a Friday night in your emergency department. A trauma call goes out. Twenty-four-yearold male with head trauma and multiple extremity abrasions after suspected electric scooter (e-scooter) accident. Agitated. Suspected intoxication… If you’re rotating or working in an urban center, trauma runs with this mechanism may already be a daily norm. San Diego, San Francisco, Washington D.C., Denver, Austin, Minneapolis, Atlanta. These are among the numerous cities with active e-scooter populations. Bird and Lime, both California-based e-scooter companies, are amongst the most recognizable names in this growing, multi-billion dollar, dockless, e-scooter sharing industry that turned one year old in September 2018. Nearly anyone with a smart-phone and the mobile application can unlock and use one of these e-scooters. From an emergency medicine perspective, the most important piece of information to know when an e-scooter trauma run is headed your way is that the e-scooters’ top speed is around 15 mph. These companies appear to promote e-scooter rider safety by clearly stating on their website and on the scooters themselves that helmets are required, a rider must be greater than 18-years-old with a valid driver’s license, only one rider per scooter, and that scooters must be ridden in bike lanes. Yet, despite safety guidelines, a stroll down any street in a city with e-scooters and non-compliance with all of the above is hard to miss. Recently, I was passed on a sidewalk by a mother with her approximately five year old child traveling at top scooter speed with the child standing in front of her on the scooter base and holding the vertical portion of the scooter handle bar base. Both were un-helmeted. Not far behind was her husband on another scooter with their other child in similar form. Though e-scooter injuries have not been characterized in current literature, one recent study took an interesting look at e-scooters safety culture. 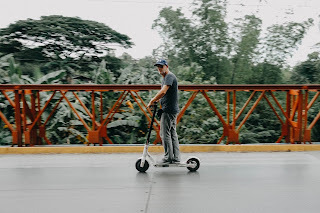 Investigators looked at Bird’s official Instagram account that had over 66,000 followers (as of Nov. 2018) and assessed posts during a one year period to determine how Bird promoted and demonstrated safety culture surrounding its product.5 The study found that 69% of posts contained a person with a Bird e-scooter. However, only 6% contained persons wearing protective gear (including a helmet, wrist guards, elbow pads, or knee pads), and 7% had protective gear somewhere in the post. Investigators concluded that Bird placed less emphasis on protective gear, which seemingly normalized a culture of safety non-compliance, especially with regard to helmets. Though Bird began offering free helmets to riders in early 2018, this action was underscored by their sponsorship of a recently passed bill (AB-2989) in the California Legislation that now allows adults to ride e-scooters without helmets (as opposed to the previous law which required helmets regardless of age).6,7 From the medical and public health perspective, it’s clear that there may be a disconnect between the e-scooter industries lax promotion of safety culture compared to the reality of an acute rise in high-speed e-scooter injuries. law). E-scooters should be no different. As clinicians, we must educate our patients on the dangers of e-scooters and collect data in order to provide tangible evidence supporting increased safety measures and regulation of the e-scooter industry. 1. Berman B. Health Officials Prepare to Track Electric Scooter Injuries. 2018. https://www.nytimes.com/2018/0/02/business/electric-scooter-safety.html. Accessed December 12th, 2018. 2. Don’t Let Your Electric Scooter Ride End in the ER. 2018. https://blog.cedars-sinai.edu/electric-scooters/. 3. Notopoulos K. Broken Bones And Missing Teeth: Scooter Injuries Are Becoming Common At Hospitals. 2018. https://www.buzzfeednews.com/article/katienotopoulos/e-scooter-injuries-are-becoming-common-inemergency-rooms. 4. Holley P. Police: Man dies after apparent electric scooter accident. 2018. https://www.washingtonpost.com/technology/2018/09/04/police-mandies-after-apparent-electric-scooter-accident/?utm_term=.c4bd77843cc4. Accessed December 12th, 2018. 5. Allem JP, Majmundar A. Are electric scooters promoted on social media with safety in mind? A case study on Bird’s Instagram. Prev Med Rep. Mar 2019;13:62-63. 6. Safety first. 2018; https://www.bird.co/safety/. Accessed December 12th, 2018. 7. AB-2989 Motorized scooter: use of helmet: maximum speed. California Legislation; 2017-2018.